Dodge traffic in this fun mini-game. There are 25 stick figures that are ready to play in traffic, how many can you safely get across the street? 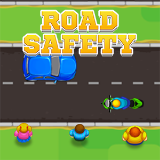 Collect power ups, avoid on coming traffic and compete for a high score in Come on, let's go Jaywalking. Use arrow keys to run. Spacebar to jump and pick up/drop traffic cones. Avoid traffic and get each stick figure to the other side.